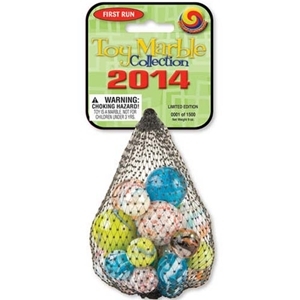 This is a limited edition net of all the new styles designed for 2014 by Mega Marble with a numbered collectible header. It includes shooter (1") marbles and player (5/8") marbles of each style that were made in the first production of these styles. The styles are Lion, Mermaid, Princess, Stingray, and Unicorn. Warning! : Choking Hazard. This toy is a marble. Not for children under 5 years.